With less than 100 delegates separating Republican presidential frontrunners Donald Trump and Sen. Ted Cruz and the race between Democratic candidates Hillary Clinton and Sen. Bernie Sanders tightening after a surprise Michigan upset, Florida will likely have significant impact on the primary when residents of the Sunshine State head to the polls next Tuesday. Florida's primary could herald a turning point in the 2016 election season, bringing about the end of some candidates' campaigns while skyrocketing others straight to the nomination thanks to its delegate-rich nature. But is the Florida primary a winner take all event? As Republican and Democratic candidates race to gather enough delegates to secure their party's nomination, they'll be looking to Florida for a major boost in numbers. As in every other state primary, Republicans and Democrats follow different rules for delegate allocation in Florida. For Republicans, the event is one of the first winner-take-all primaries of the party's nomination race. Democrats, meanwhile, award their delegates under a proportional system. With 99 delegates up for grabs in Florida's Republican primary, Trump could easily double his 99 delegate lead over Cruz should Florida Sen. Marco Rubio fail to win his home state. All but two polls released this month show the business mogul holding a double-digit lead over the Florida senator, with Cruz and Ohio Gov. John Kasich trailing behind. Florida has been defined as Rubio's must-win state, and indeed, a win there would certainly boost the freshman senator's flagging campaign after a dismal performance in the Michigan, Mississippi, and Idaho primaries resulted in zero delegates. A loss — or even a second-place showing — in the Sunshine State next week, however, could spell the end to Rubio's White House dreams. For Trump, however, a win in Florida (with a second winner-take-all victory in Ohio that same evening) would put the Republican frontrunner a little more than halfway to securing the 1,237 delegates needed to win the GOP nominee. According to a delegate count by the Associated Press, Cruz currently stands as Trump's biggest competition with 359 delegates to his 458. Trump would easily double his lead over Cruz should he best Rubio at the polls in Florida on Tuesday. A simultaneous win in Ohio would see him earn 165 delegates in total. Democrat's proportionate system of delegate allocation in Florida is good news for Sanders, who recent polls show is trailing Clinton by 30 or more points in the state. The state will divide a total of 214 pledged delegates between the two candidates according to the votes. Sanders' campaign is hoping to repeat the surprise come-from-behind win they saw in the Michigan primary last week but is severely unlikely to overtake Clinton as the frontrunner. The former secretary of state has won 767 pledged delegates so far, giving her a 214-delegate lead over the Vermont senator. Under Democrat's proportionate system of delegate allocation, Sanders would have to win every single vote in Florida to garner the delegates needed to close the gap between him and Clinton. A feat that would be impossible even for a candidate ahead in local polls. 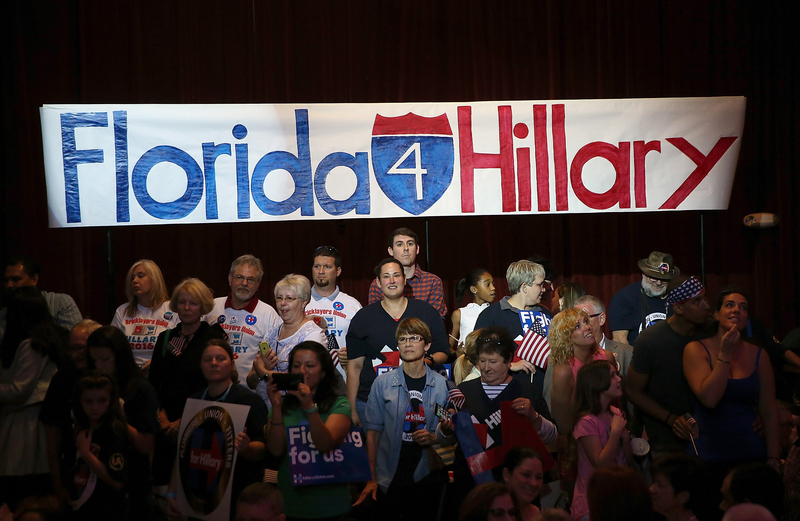 Florida's primary isn't likely to decide the nominations. But the state does stand — especially for Republicans — to have a considerable impact on the shape of the race going forward by serving as a make or break situation for some candidates (I'm looking at you, Rubio) due to its winner-take-all element.